Do you grab something to eat on your way out the door in the morning? Or raid the fridge at lunchtime to see what?s there, eating whatever left-overs are available? If you?re on your own, do you even bother to do that? Maybe, you grab a handful of nuts, or a piece of fruit, or some ice cream because it?s quick and it?s there! When you eat, do you put your food on a plate, sit down and take your time? Or do you just stuff the food into your mouth, whilst checking homework, reading a book, driving to work or watching TV? One of the problems with eating this way is that, most of the time, you probably don?t even know what you?ve eaten! You probably have no idea how much you?ve eaten – unless the packet is empty! It?s a very easy way to eat too much, too fast. It also contributes to your stress levels and your digestive system probably won?t be very happy either. How about taking your time? Being mindful? Eating is best done slowly, mindfully, joyfully. Appreciating every mouthful. Just once in a while, try some mindful eating! Before you start eating, pause to reflect on the way you feel. Are you stressed? Are you bored? Are you hungry? Or are you just eating because the clock says it?s time? Does the food in front of you look appealing? After you pause and reflect, you might change your mind about what you actually want to eat and how much you food you really want. Listen to your body. Listen to your feelings. Listen to your inner knowing. Turn off your phone or the TV. Put down your book. Just for now, just for this meal, focus on this one thing ? eating mindfully. Sit down. Be silent. Focus on your food. Smell your food. Close your eyes and really focus on the smells. Inhale the aromas on your plate. Savour them. Taste your food, one mouthful at a time. Really take your time, appreciating each flavour and texture. Move the food around in your mouth. Notice the juiciness of the meat, the crunchiness of the carrots, the smoothness of the sauce, the balance of the flavours. Try to eat really, really slowly. Remember the days when you were told to chew each mouthful 30 times? Do that! Notice how peaceful it is to eat a meal without talking, listening to the news, reading a book. Think about what?s on your plate. The effort to cook it, to bring it home from the shops, to buy it, the drivers who brought the produce to the shop, the people who prepared it for transporting, the farmers who grew it, all the way back to the origins of the food you?re eating. Think of the seed that grew into the food on your plate. When you are satisfied ? not full ? stop. You don?t need to eat everything on your plate! Keep the rest for later. How does it feel? Did you enjoy that? We have so many rules around food. We load up the simple act of eating with overtones of good and bad, right and wrong. What to eat and what not to eat ? only to find out that the guidelines were wrong after all! Stop and listen to your body. What does it want to eat? 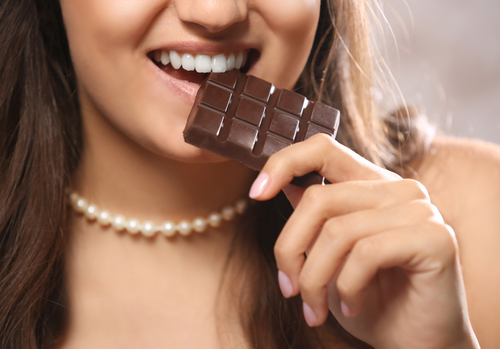 If you really love chocolate, instead of scoffing the whole bar, just have a square and make it last. Let it melt in your mouth, trying not to chew it and savour every last morsel of it. If we just did more mindful eating, more often, I?m sure that the diet industry would collapse! You would be eating enough ? not too much. You would be eating the food that your body really wants, not just some random food that happened to be there or was quick to buy and eat. Ideal size and weight is achieved mostly (80%) by what you eat and only a little (20%) by exercise. Of course, regular massage will help keep you on track too! Here’s a video from?Thich Nhat Hanh on Mindful Eating, just for fun. Care to join me in more mindful eating?